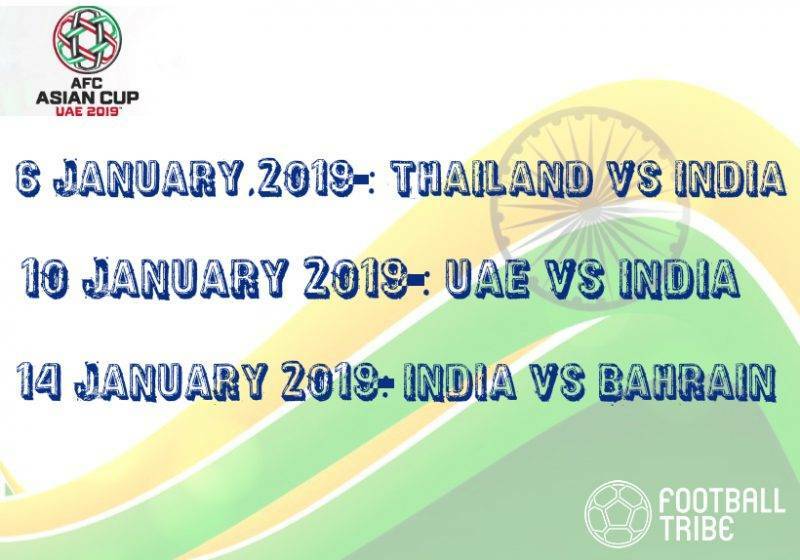 The much-anticipated fixture for the AFC Asian Cup UAE 2019 was released by AFC on Monday as India faces ASEAN powerhouse Thailand in their opening on 6th January 2018 at 5:30 pm. AFC has been proactive in their scheduling of games factoring the five time zones of AFC regions and have scheduled East and ASEAN zones are scheduled to commence at 3:00 pm and 5:30 pm, ahead of the last 8:00 pm Group Stage kick-off. India opens their AFC Asian Cup venture against Thailand at the Al Nahyan Stadium, Abu Dhabi on 6th January,2018 followed by the tough challenge from hosts UAE on 10th January 2018 at the Zayed Sports City Stadium. India will face their final game of Group A against Bahrain on 14th January at the Sharjah Stadium. India will have their task cut-out as all three teams in their Group will present distinct challenges in terms of playing style and approach. The Blue Tigers would be hoping to carry their qualification form forward backed by strong expat support to rise to the occasion of billion people’s dream.